The shower in our guest bathroom runs cold and takes forever to heat up. It can be sign your water heater is ready to heave its last breath. Sure enough after 11 years of faithful service, our water heater went to that great metal recycling plant in the sky. Well, actually, it went to a metal recycling plant down the round but in the sky sounds more poetic. Shower water still took forever to heat with the new water heater. 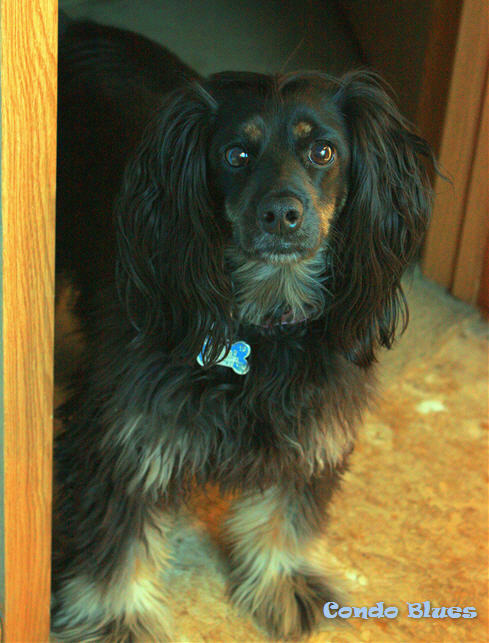 I thought it was set at a lower temperature until we passed inspection from the natural gas company. The natural gas inspector told me our hot water heater passed with flying colors and is already set at the correct temperature. He said the issue is with the faucet not the water heater. The water temperature regulator (also known as a scald valve) on the faucet is set too low. 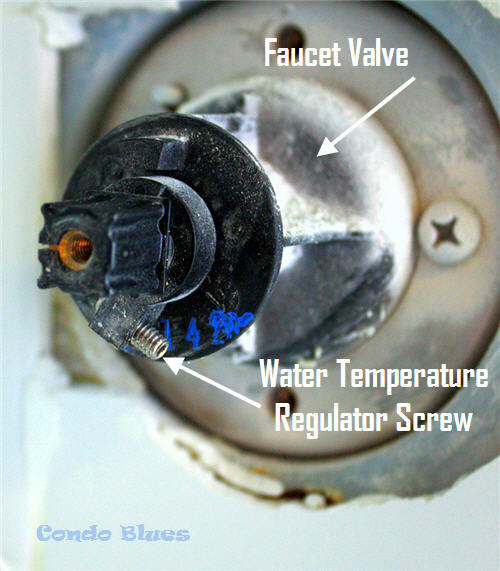 Fortunately, adjusting a faucet water temperature regulator is a quick and easy fix. It will also save us money. 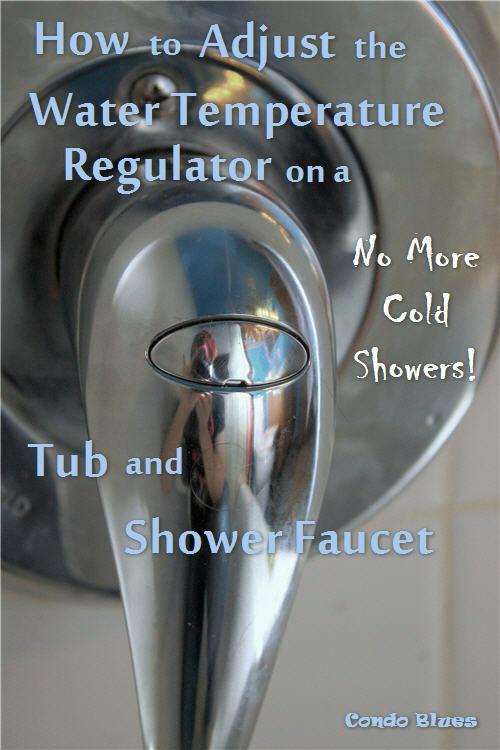 We won’t waste water or natural gas waiting for bath and shower water to warm up. Adjusting the water temperature on a bathroom faucet is simple but every brand is a little different. My house came with a Kohler faucet in the bath tub and shower so that’s what I will be using for this tutorial. Welcome to the most expensive DIY tool in the world! 1. 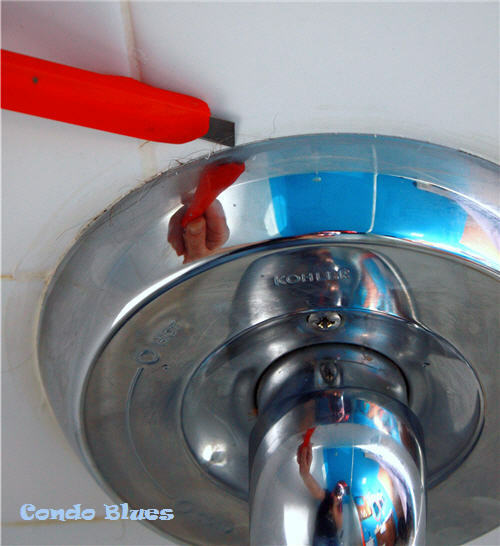 Use the utility knife to slice through the caulk seal around the shower faucet. Be careful and don't scratch the tile with your utility knife! 2. Pop the handle screw cover off with the flat head screwdriver. It should fit into the small slot at the bottom of the screw plate and gently come off. If you are wondering about my strange reflection in these tutorial photos, yes, I had to sit in the bathtub to take them. I do this for you Internet! 3. 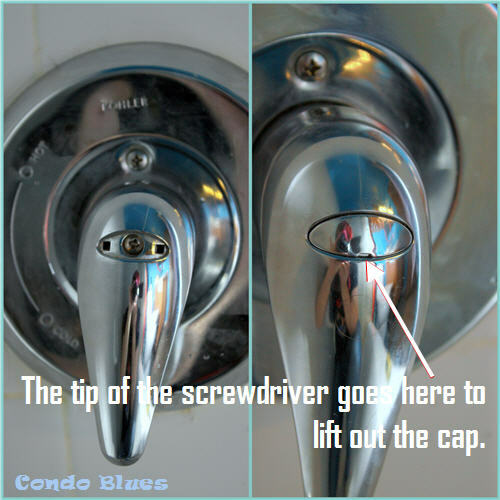 Use the Phillips head screwdriver to remove the screws holding the handle and faucet face plate in place and place the screws, handle, and face plate aside. 4. Use the appropriate size hex key wrench to adjust the small screw at the bottom of the valve. 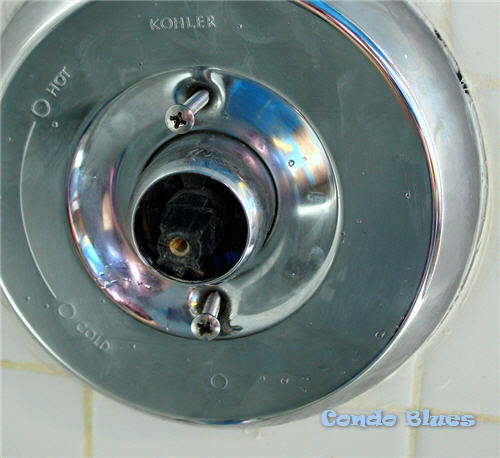 Turn the screw toward you to make the water flow hotter from the faucet. Turn the screw toward the wall to make the water flow colder from the faucet. Remember, different brands will have slightly different water temperature regulator than the one shown here. 5. Place the faucet handle on the valve, turn on the water and test the water temperature with your hand. Caution: Be careful not to adjust the water temperature too hot or it may become a scaling risk! If you are not confident in your abilities please seek out a professional. 6. 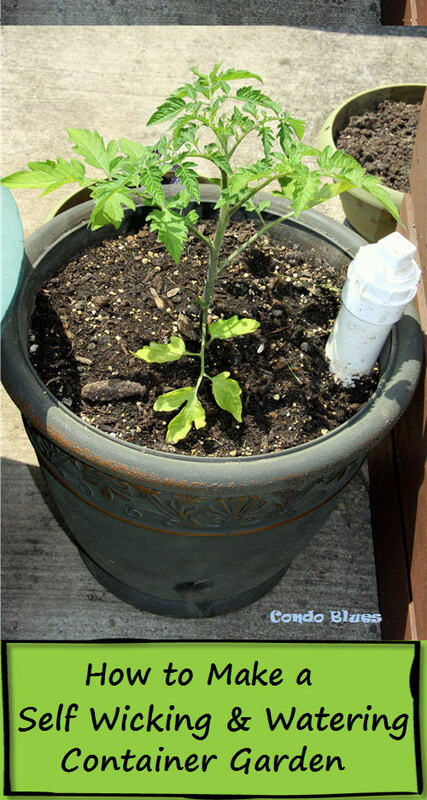 Based on your test in Step 5, readjust the faucet water temperature as needed using Step 4. Tip: I made a small turn with the hex wrench, tested the water temperature with my hand, made another adjustment, tested it with my hand, etc. until the water temperature regulator was set at a temperature both Husband and I were comfortable with. I think this is a safer method than making one mighty turn and burring my hand with hot water during testing. 7. Repeat Steps 4-6 until the water flowing from the faucet is as hot or cold as you desire. 8. Reinstall the faucet face plate and faucet handle. Use the Phillips head screw driver and screws to screw them back into place. 9. Slide the handle screw cover into place. 10. Run a bead of silicone caulk around the edge of the faucet. 11. 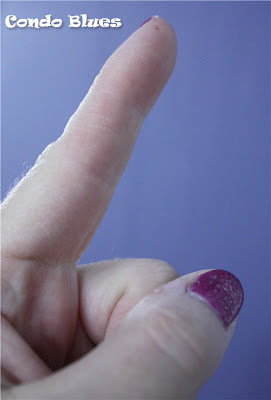 Use your finger to smooth the bead of caulk. 13. Take a deliciously warm shower or bath!